After joining Pitti Uomo as a guest in January, Portugal aims to strengthen its status as a leading fashion destination beyond manufacturing. FashionNetwork.com visited ModaLisboa to meet the nation’s top designers. 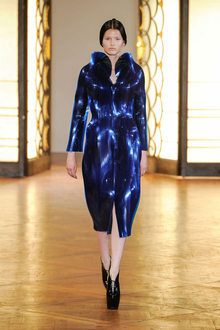 The Paris Haute Couture Week showcased several labels making widespread use of cutting-edge technology, from pioneer Iris Van Herpen to emerging names Flora Miranda and Yuima Nakazato. The Dutch designer, inspired by celestial cartography, created a collection of sculptural clothes, morphing women into clouds, flowers and birds in a striking show. From 17 November 2018 until 24 March 2019, the exhibition Femmes Fatales – Strong Women in Fashion will be on view at Gemeentemuseum The Hague, focusing on female fashion designers. The Paris haute couture season witnessed two radically different fashion moments Monday, the remarkable organic high-tech of Dutchwoman Iris van Herpen, and the off-beat maximalism of Australia’s Romance Was Born. Fashion designer David Laport will create costumes for the Dutch National Opera & Ballet’s International Young Patrons Gala. Laport will collaborate with choreographer Peter Leung. Fashion designer Bas Kosters has been awarded with a Cultuurfonds Mode Stipendium, the most prestigious fashion prize in the Netherlands. Previous recipients include Iris van Herpen and Ronald van der Kemp. The Netherlands’ State of Fashion has announced the dates and participants of the 2018 exhibition. The initiative, which focuses on the sustainable future of the fashion industry, will run 1 June-22 July 2018. Dutch couturier Iris van Herpen has designed the costumes of Opera Ballet Vlaanderen’s Pelléas et Mélisande show. The performance premiered on Friday in Antwerp. The Japanese designer presented a rather avant-garde collection for Haute Couture in Paris, in which certain pieces were available to buy after the show, ready to be custom-made in a showroom using new technologies. The first Spring/Summer 2018 haute couture shows stormed the catwalks of Paris on Monday, and they didn't disappoint -- particularly when it came to offbeat beauty inspiration. Haute Couture: the Dutch designer took inspiration form aerial views of the Earth in creating a collection of 'tattooed' garments with African accents and shapes that fluttered like birds. Cube Design Museum will stage an exhibition on extraordinary shoe design. The show will look into designs worn by celebrities, innovations and the role shoes play in society. Guillaume Houzé, of the Galeries Lafayette group, has been appointed President of French fashion association ANDAM, succeeding the recently deceased Pierre Bergé, who chaired it since its inception. Centraal Museum Utrecht is to stage an exhibition on Dutch couturier Jan Taminiau offering an overview of the designer’s work that is set to premiere in April next year. Fashion designer Iris van Herpen has won the 2017 Johannes Vermeer Award. The 100,000 euro prize was awarded by the Dutch government in recognition of the designer's creative talent.